You want to ask friends about a topic via email and want to specify “Yes”, “No” or “May be” as optional answers. You can gather votes easily with the help of the vote buttons. Draft a new message and select the recipients. In the menu bar, click on “Options” tab and check “Use voting buttons” in “Voting and Tracking” options. Select one from the three default options like “Approve/ Reject”, “Yes/No” or “Yes/No/Maybe”. You can even custom-define responses by giving the options separated by semicolon one after the other. Formulate the suitable question in the email text and send the message to the desired recipients. The recipients will be notified of the voting option at the top of the message. They can click on “Vote” to reply. They can reply immediately using the set replies or change it and send it by clicking on “Ok”. The sender can view the results of the answers in a summary and need not read or edit each reply individually. Instead, the sender can open his original email in the “Sent items” folder and click on “Tracking”. He will be able to see an overview of the results, followed by a list of the individual replies. 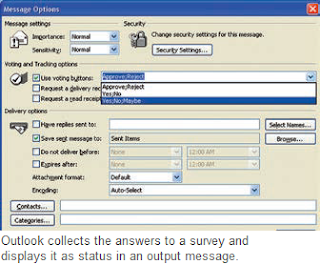 However, this method of voting functions only internally via various Outlook versions, but not with other mail programs like Thunderbird.